Wedding fever! Amy's mum is preparing to tie the knot with Dave – but while everyone's been caught up in confetti and cake, the groom has gone AWOL. 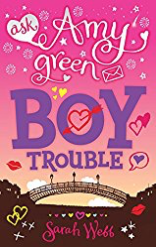 Meanwhile, Amy's boyfriend, Seth, isn't speaking to her and her best friend, Mills, is having yet more boy trouble. Can life get any more complicated for Amy? The last book in the Ask Amy Green series. When my little sister, Emma got married a few years ago, I was one of her bridesmaids which was such fun. Emma’s wedding inspired Sylvie and Dave’s wedding in Wedding Belles. Emma’s reception was in our mum and dad's garden in a big marquee, like just Sylvie and Dave’s. At Emma’s wedding I wore a turquoise lace dress and a little white cardigan over my shoulders with sky blue flowers embroidered around the neck and down the front. My other sister, Kate was also a bridesmaid, along with Emma’s friend, Suzi, and we all had sweet lily and rose bouquets to hold. Weddings are very special events and it was so much fun writing about Sylvie and Dave and their wedding (Amy’s mum and step-dad) in Wedding Belles. Hope you enjoy it! Dancing dilemmas . . .
Mills’s ballerina sister, Claire Starr has just landed the role of a lifetime but something is very wrong with the young star. A worried Mills begs best friend Amy for help. How can Amy refuse, even though she has big problems of her own to solve. Luckily her clever (and crazy) aunt Clover is happy to lend a hand. And saving dancing divas is all in a day’s work for the intrepid twosome. I LOVE ballet. I’ve been ballet ballistic ever since I was a little girl. I started studying ballet when I was five and I took classes until I was a teenager. Here is an old photo of me when I was about thirteen. Don’t I look serious? My godmother, June once took me to see a famous English dancer called John Gilpin who was dancing in the Pavilion Theatre in Dun Laoghaire (before its current reincarnation). Luckily she loved the ballet too, and understood my need to be ‘up the front’ and always booked the front row seats so that I could watch the dancers’ feet and smell the resin. When we were sitting in the auditorium (in the front row), waiting for the ballet to begin (I think it was Swan Lake), she pressed a wrapped present into my hands. I opened it up. It was a small leather-bound autograph book. ‘You can get the dancers’ autographs after the show,’ she said. I was so excited during the performance that I could hardly sit still. Afterwards we waited at the stage door. I was a nervous wreck. ‘Are you sure they won’t mind?’ I asked her. ‘Not at all,’ she said. ‘I’m sure they’d love to sign your book.’ And she was right. A few of the female dancers came out first and happily signed my pages. And then – John Gilpin himself – tall and handsome, with a strong but kind face. I thrust the book at him silently, hopelessly tongue-tied and he just smiled. ‘A little ballerina in the making, yes?’ he said, writing his signature with a flourish. I just nodded, my cheeks burning with happiness. It was my first encounter with a ‘famous’ person and I’ve never forgotten it. I still have that little brown leather autograph book, complete with John Gilpin’s signature and I’m a huge ballet fan to this day; a ballerina, sadly no. But the great thing about being a writer is that I can write about my passions, and for Ask Amy Green: Dancing Daze, I got to interview real ballerinas about their lives as dancers. Happy days! In March last year I travelled to Budapest in Hungary with a group of friends. We stayed in this amazing boutique hotel called Brody House which is owned by an English friend of ours. The city is wonderful and I adored just walking around, soaking up the atmosphere and day dreaming about Claire, and how she must feel walking the very same streets. We also visited the Gellért Baths, where one of the scenes in Dancing Daze is set and had a wonderful soak in the warm salt water, and even visited the steam room, just like Amy and Clover! In the book Amy describes it as ‘pretty swish in an Addams Family kind of way: murky, with lots of big ferny pot plants, stained-glass windows, and funny little stairways.’ Maybe one day you’ll visit the baths, just like Amy and Clover, it’s quite an experience! I do hope you enjoy Dancing Daze and if you ever get to visit Budapest, jump at the chance. It really is a wonderful city, full of character. You never know, you might even bump in to me, wandering the streets, and day dreaming about another book . . .
You can find out more about the Ask Amy Green books on the special Amy Green website here.